As a lot of you know, I’m looking for a way to make the Huck Loves Her Bucks (HLHB) Trend-Catcher System to yield more signals and still get the same cool results as it did in 2016. Read all about the HLHB Trend-Catcher System if you want to know more about its original entry and exit rules! Last week I presented the backtest results when I use the 4-hour system instead of the usual 1-hour time frame. Not only that, but I also widened the trailing stop from 50 to 150 pips while the profit target was also raised from 200 pips to 400 pips. The backtest results were not bad, but they weren’t too fantastic, either. I ended up missing a lot of good trades while still getting more than a few fakeouts. This week, due to popular demand, I’m adding the Average Directional Index (ADX) indicator. Basically, the index measures the STRENGTH of a trend. A reading of 20 and above usually means that the pair has momentum to go in either direction. For my purposes, I’ll use 25 as my basis for entry. 1. 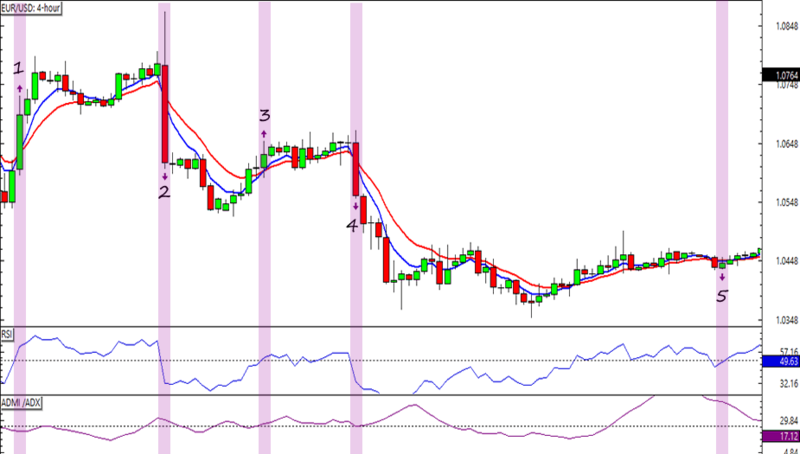 BUY when the 5 EMA crosses above the 10 EMA AND ADX is above 25 AND RSI has just crossed above the 50 mark. 2. SELL when the 5 EMA crosses below the 10 EMA AND ADX is above 25 AND RSI has just crossed below 50. 3. Use a 150-pip trailing stop. 4. Set profit targets 400 pips away from entry price. 5. Close open trades when a new VALID signal, well, signals. In our example above, only signals 2, 3, and 4 are valid. And, unfortunately, only signal #4 yielded positive pips. Still, the system gained a net of +57 pips from the period above. Not a very promising start, I admit, but still looks legit enough for a closer look. I’ll backtest the tweaks on the past couple of trading quarters and let you know of the results next week. Let me know if you have any questions!